A microwave oven is available everywhere because of the value it brings to heating dishes in minutes. It is essential to make sure that your microwave oven is kept in a place where it will be safe and also convenient whenever it is required. That is why Royal Industries brings forth this microwave shelf (ROY MS 2424). 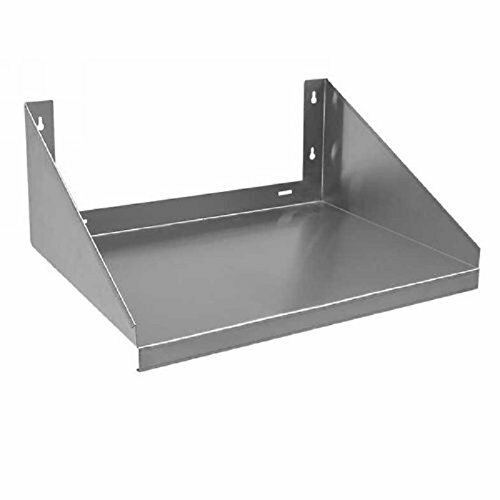 This microwave shelf measures 24" x 24" and will perfectly hold your commercial microwave safely and securely for you to use it at your convenience. This shelf will also consume lesser space than the microwave carts or stands. Made of 18-gauge stainless steel, this microwave shelf of commercial grade will be very durable. 18-GAUGE STAINLESS STEEL SHELF: This 18-GAUGE stainless steel shelf is very tough and durable making it safely support the microwave oven without any issues. 24" x 24" SHELF: This regency microwave oven shelf measures 24" x 24" and will be very helpful in keeping your microwave oven within your reach. OCCUPIES LESSER SPACE THAN A MICROWAVE CART OR STAND: This microwave shelf will be the best alternative for the microwave carts and stands and occupies very less space. SOLID SHELF WITH CAPACITY UPTO 200 LB: This shelf is having a capacity of upto 200 lb so that your microwave oven will be safe and secure always on this shelf. PRODUCT SPECIFICATIONS: Measures 24" x 24", NSF listed, Material: Stainless steel, Product Weight: 14 lbs. Capacity: 200 lb.